With tax time coming up for those living in the United States, many are searching for ways to help save them from the eager reach of the IRS. The ‘Revenue Man‘ has long been the enemy of those on the outside of the thin ranks of the social elite, so it’s no surprise that the powerful Patroness of the Dispossessed shows special care towards helping to increase the luck and fortune of those who seek her favor. 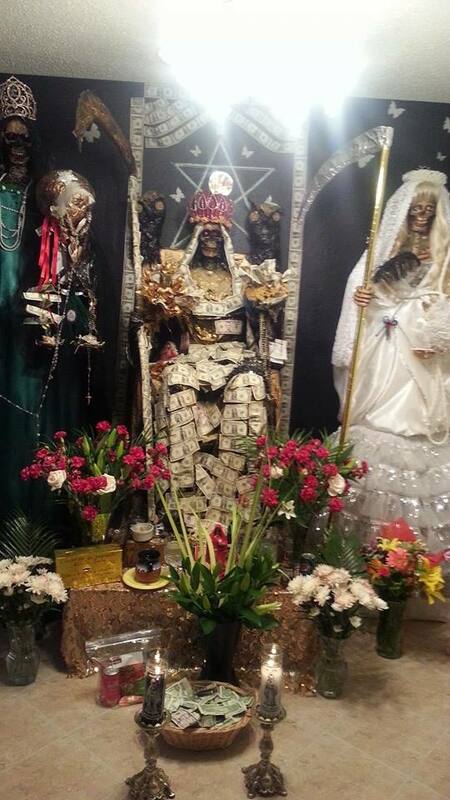 As devotion to Santa Muerte has grown, the traditional three colors of white, red and black associated with her ‘working’ aspect have expanded into more specified colors to deal with individual requests. For those who work exclusively with her original trinity, petitions are focused through what is offered at the altar and particular prayers. 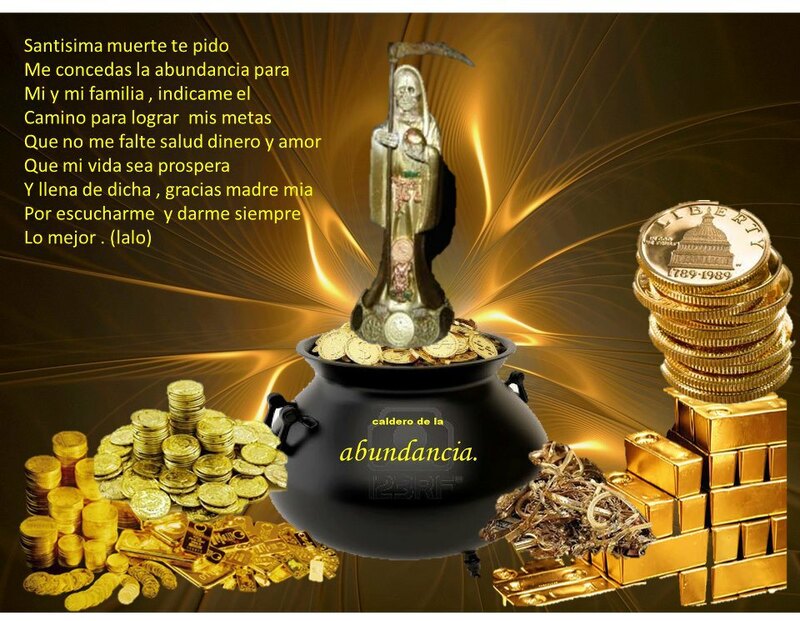 The popular market encourages diversity, however, and la Madre de la Buena Suerte has taken on a golden hue to represent her place as a potential provider of wealth. In this aspect she can often be found cloaked in money, creating a striking demonstration of her powers over the fortunes of those who follow her. As in all of her manifestations, the open potential of ‘death itself’ is highlighted in the fact that she fills whatever need is at hand. Her icons, imagery and devotional representations become a powerful reminder of her prevailing position in every facet of her devotees’ life. Dr. Andrew Chesnut has noted in his research that these innovations, alterations and adaptations have allowed her to supplant competing folk saints through a diverse line of spiritual products that take care of every need. 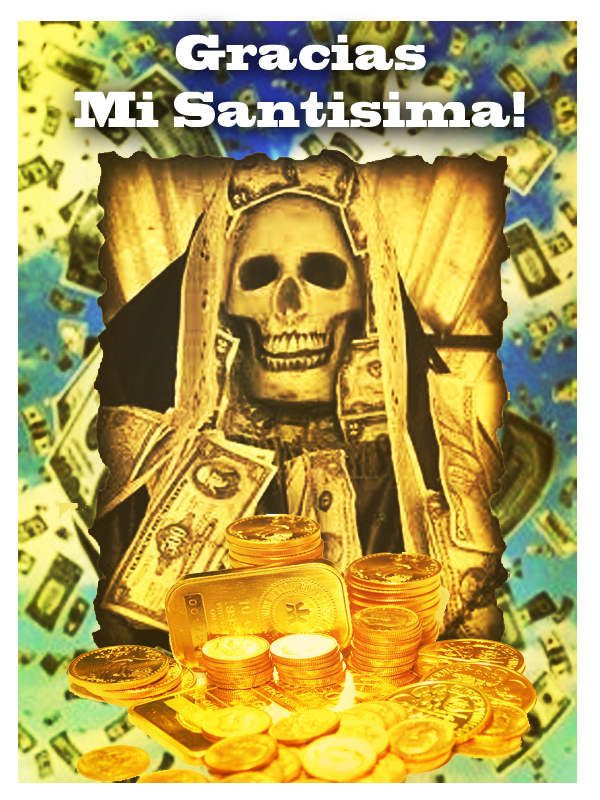 This alone gives credence to the idea that where la Santisima appears, prosperity lies close at hand for those who know how to work with her. From conversations with a number of botanica owners, this even extends to those who simply support the needs of local devotees, despite their own disinterest in la Nina Bonita’s presence in their store. In This Prayer It Says a Statue, but a Picture Will Work Just Fine,As Long As It Comes from Your Heart and Soul. With Health, Work and Money. Let the Flow of Gold, Silver and Green Rain Down on Me. Bless Me With Steady Work. Bless Me With Good Health. Bless My Wallet With Extra Money. for Blessing Me With the Three Colors of Gold, Silver and Green. and I Promise a Statue of You My Golden Queen. a Gift That Comes from My Heart to You. 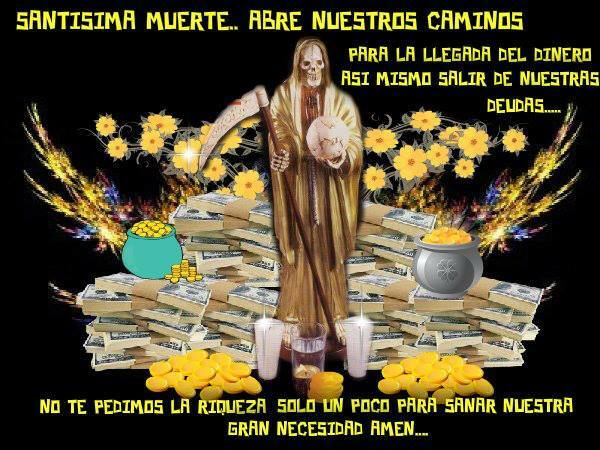 to Say Thank You Santa Muerte. to Thank You for Hearing My Prayer. 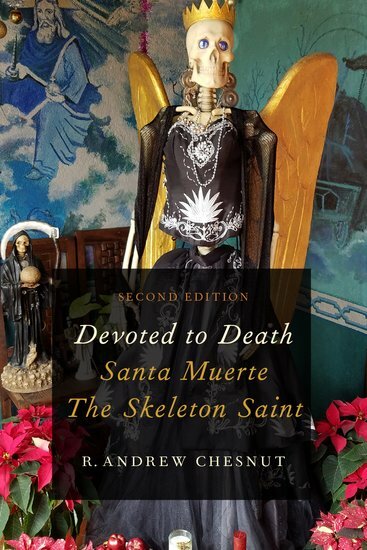 Whether she’s found in a vision, a home altar, a street side shrine or in a digital image, Santa Muerte makes her presence known with every tender tick of the clock. 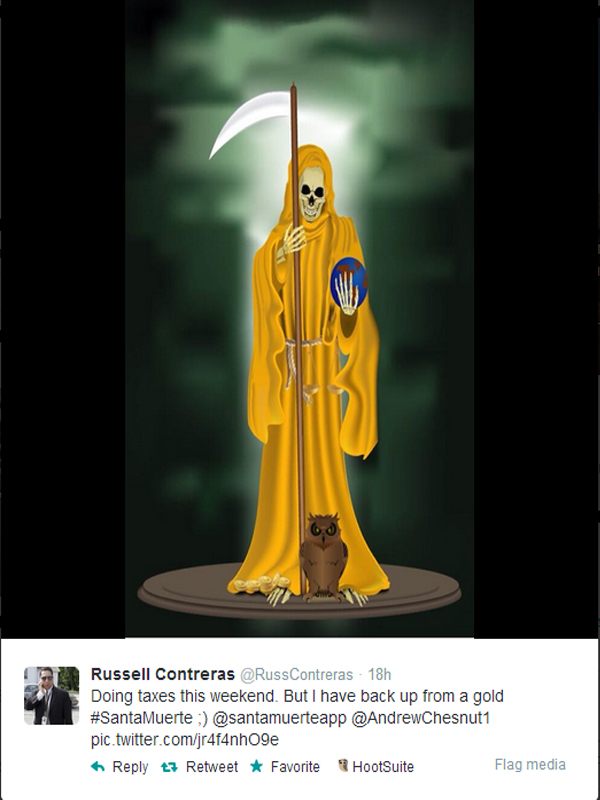 When she holds back her scythe from the chord of life she offers health, and when she holds back from cutting off avenues of wealth and well-being she can offer a healthy fortune. 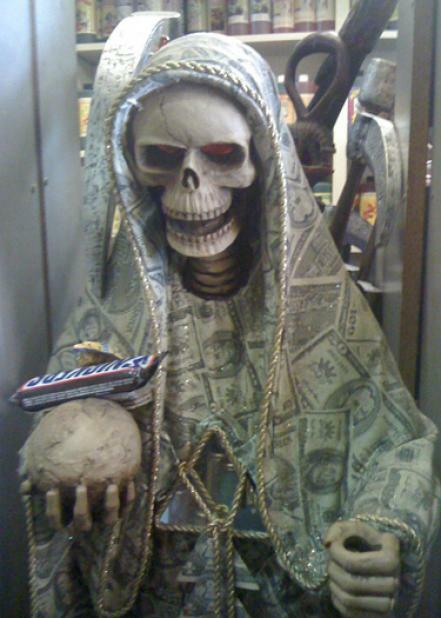 So when the tax collector comes around remember, whatever power they might think they have, Saint Death’s sitting around the corner waiting for them with a smile and an appointment sheet for a different kind of audit and when la Madre Poderosa is ready she doesn’t accept extensions.